One year after they tied the knot, Jaime and Tim celebrated in a creative way by doing a photo shoot with their wedding photographer Shane Welch Photography. Despite a sudden downpour, Naturally Yours Events expertly styled a stunning anniversary shoot that embraced the weather along with the great outdoors. 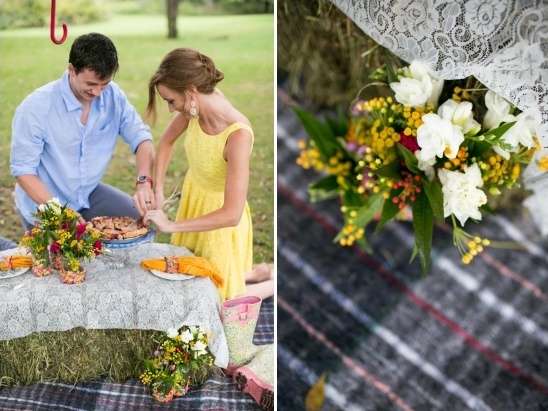 Beginning with a picnic of pie and ending with an explosion of eco-friendly confetti, this photo shoot is full of fun ideas that are perfect for anniversary and engagement sessions alike! Continue reading to hear so much more from Naturally Yours Events and Jaime about the photo shoot, especially Jaime's favorite moments from the day. 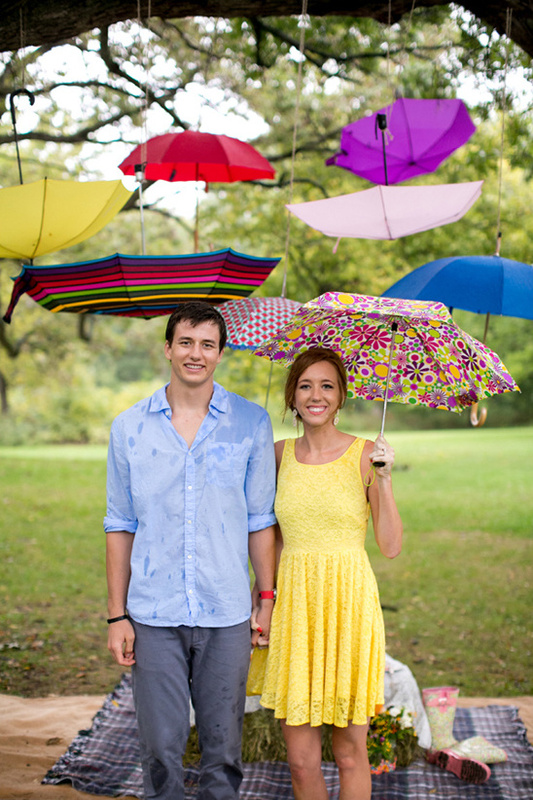 Don't forget, you can view more of the amazing images Shane Welch Photography captured of this colorful rainy day anniversary session in the full gallery here. From Naturally Yours Events:The concept of this shoot started with the newlywed's love of all things rustic and outdoors. And since, traditionally, your first year’s anniversary gift is paper, this shoot made sure to incorporate a very fun and whimsical feel through paper confetti. 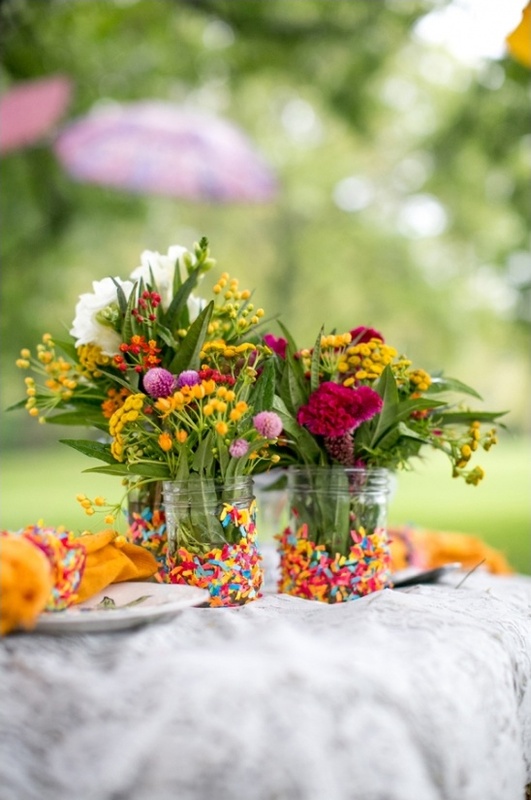 We did a lot of DIY projects for this shoot which included confetti dipped mason jars for the flower vases and napkin rings. 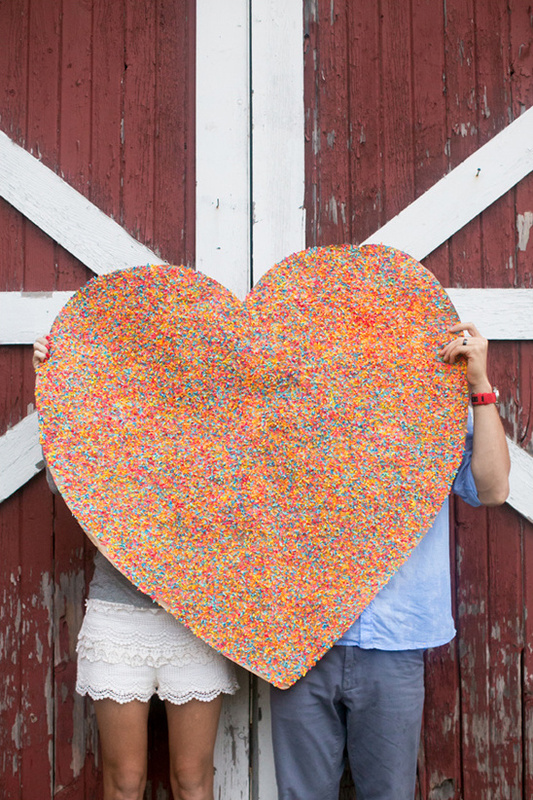 What I love most is the giant confetti heart we used to decorate the barn. 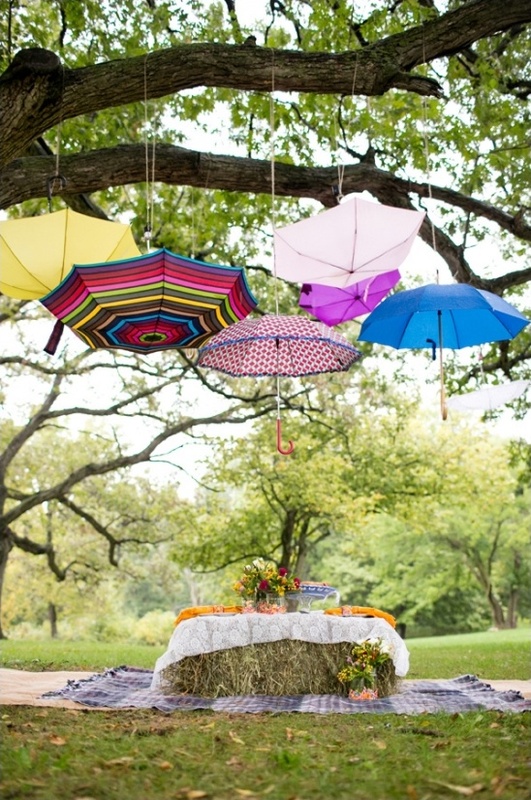 Because of the weather, we had to find a clever way to keep the couple dry and still execute our vision of an outdoorsy picnic on the farm. 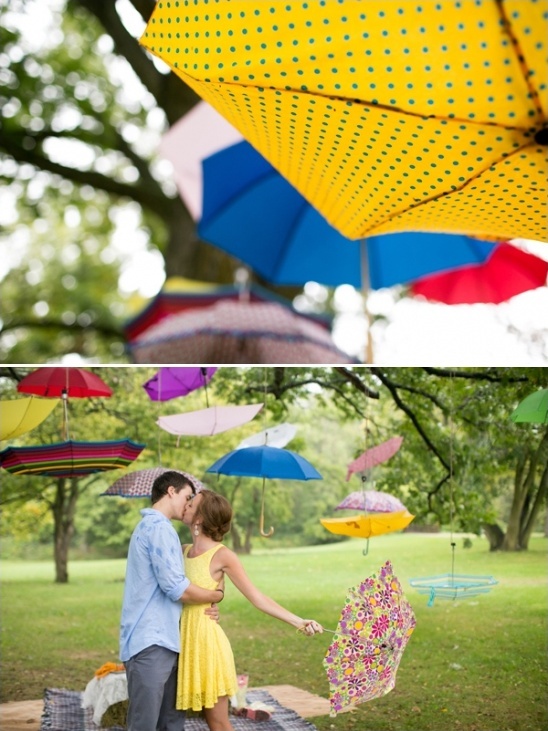 So we strung up tons of colorful umbrellas in the trees to act as a canopy. Jaime and Tim were able to stay dry, despite a total downpour, and have their pie and eat it too! We used a bale of hay as a table with a lacy table cloth, adorable plates from BHLDN to serve the pie, and a bunch of colorful wildflowers to mimic the look of party confetti. From the Bride:The one year anniversary traditional symbol is paper, so I knew I wanted to incorporate that somehow. 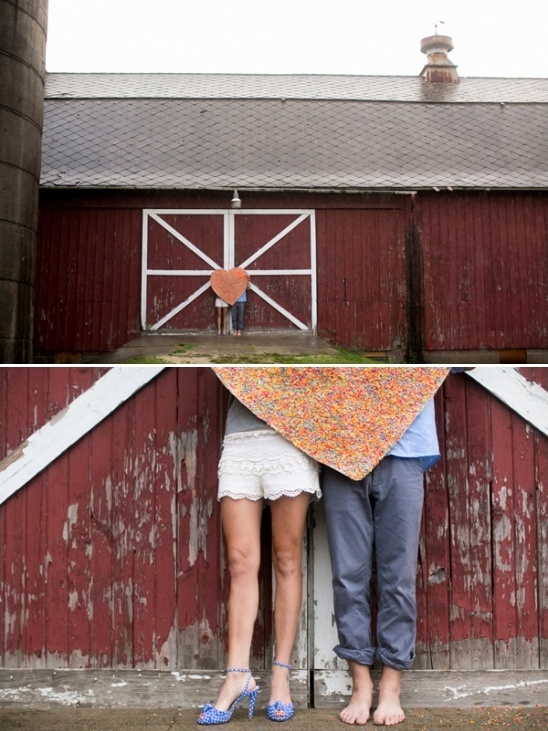 We threw around a couple of ideas, and Carlene went above and beyond with the incredible heart (pictured on the barn). My husband and I are really active and love being outside, so we also knew we wanted something rustic and outdoorsy, especially since our wedding was in a more urban setting. From Naturally Yours Events:Confetti was everywhere that day as Jamie and Tim threw eco-friendly confetti at each other that dissolved almost instantly in the rain. 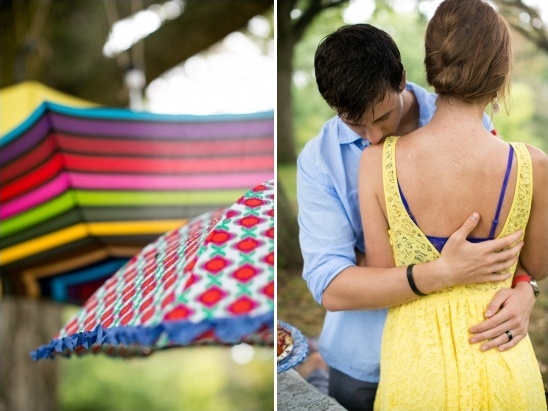 We couldn't ask for a better day for such a fun and adorable anniversary shoot. And these photos really do show you can still have a beautiful shoot in a monsoon. Read on to hear some of Jaime's favorite moments from the day! I truly wouldn't do anything differently. Even the weather ended up making for some incredible memories and photos! I am so glad we decided to do an anniversary session because, when you get married, there is all this excitement leading up to the big day (and with good reason - there is so much goodness to celebrate! ), but I also believe there is much reason to celebrate and commemorate anniversaries, and we will cherish these memories for a long, long time. One of my favorite moments was when we pulled up to our location, only to see Carlene (owner of Naturally Yours Events), Shane (our photographer), and Sam (his assistant) all standing outside in the pouring rain, sopping wet but working as a team to make sure everything was 100% perfect - from the tablescape to the umbrella spacing. I was so sad they were soaked (and probably freezing), but that moment so perfectly captured their dedication to us as a couple and to the photo shoot. They genuinely love what they do, and that comes through in their work. My second favorite moment was when the rain turned to a slight drizzle, and the clouds parted. There was the most beautiful sunset, and the park where we were taking photos was about to close. We all took off running towards the field because we knew we only had a few minutes of that gorgeous light. We were all laughing and smiling as we ran, which was the perfect way to end our night. My husband had taken a job in Austin, Texas, and this shoot was actually done the very night we moved out of our apartment. When Debbie and Pamela arrived at our apartment, they set up in the middle of the chaos without blinking an eye - there were boxes being packed up and moved out as they got me ready! Not to mention it decided to pour down rain that day. They were both so calm and kind and helped me feel relaxed amidst the craziness. The whole day was full of hustle and bustle, so when we got to the shoot, we took a deep breath and enjoyed every minute. It was such a perfect way to end our time in Chicago, as the next morning we waved goodbye to the city that held all of our first year memories!